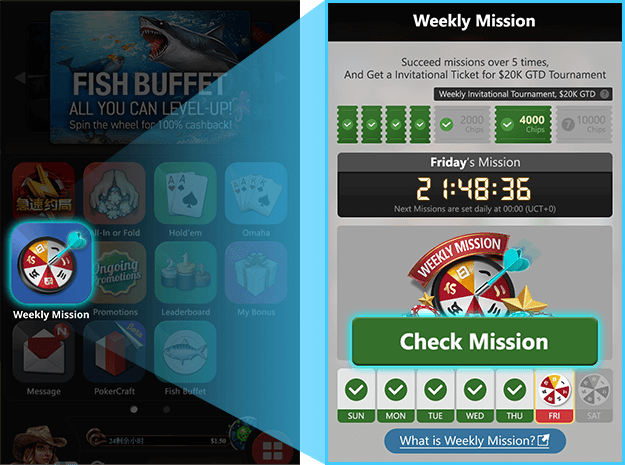 Complete five or more missions each week for a seat at the weekly ‘Mission Complete $5,000 Freeroll’! Each day you can choose one out of three easy missions to do; completing more than five days a week will give you more chips at the weekly tournament, so make sure you check your missions, daily! Check your Weekly Mission page, and open up your mission. Choose one of the three missions for the day, and complete it while playing. Complete at least five per week (Sunday to Saturday), and receive automatic registration to the Mission Complete $5,000 Freeroll. Enjoy the weekly Mission Complete $5,000 Freeroll Information on Sundays, and claim your prize! Starting Chips: Chips are given based on the number of missions completed for the relevant week. 2. Mission must be opened and checked before starting. 3. Missions can only be completed with the main pot unless specified otherwise. 4. Missions can only be completed by running the board once unless specified otherwise. 5. Missions regarding tournaments can only be completed if the tournament ends before mission resets. 6. Missions will be based on the UTC time zone. A day starts at 00:00 and ends at 23:59 (UTC+0). 7. Weekly mission count resets on Sunday, 00:00:00 (UTC+0). 8. At least one hole card must be used for Hold’em and AoF Hold’em missions. 9. The promoter has sole and absolute discretion for issuing ‘Bonus Days’ due to foreseeable events that may interfere with weekly missions. 10. The promoter has sole and absolute discretion for granting free completion of missions due to unforeseeable events that may interfere with weekly missions. 12. GGNetwork standard rules apply.